“The Tale of the Chosen King, Savior to the Star.” For many, Final Fantasy XV has been a 10-year long saga. First conceived as Final Fantasy Versus XIII, a decision was later made to turn it into the next mainline game, and, at E3 2013, the rebrand was revealed to the world. Fast forward, and, after a movie, animated series and small-scale spin-off games, we now have the chance to experience Square Enix’s “fantasy based on reality” on Nintendo Switch. Except, it’s different. 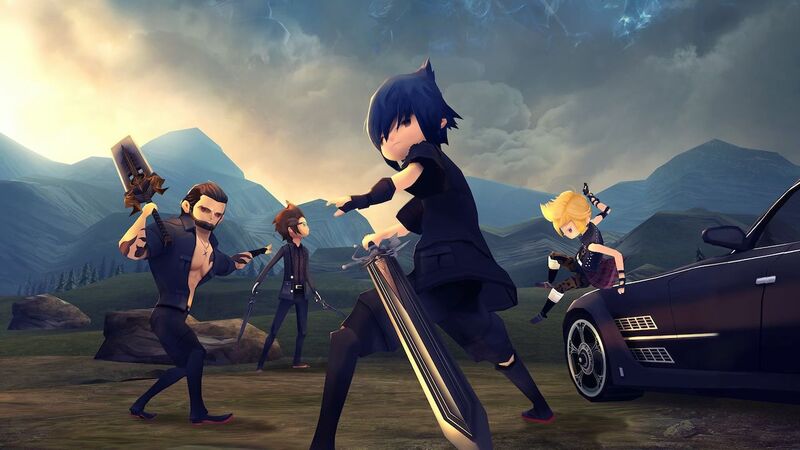 Final Fantasy XV Pocket Edition HD swaps out the scale of the original game’s open-world for linear progression, switches realistic character models for more adorable chibi designs and has simplified the combat system. The result? It’s a compact and far more accessible retelling that retreads the pivotal scenes in Final Fantasy XV, as crown prince Noctis and his brothers in arms – Gladiolus, Ignis and Prompto – strive to reclaim their homeland after the Empire of Niflheim murder his father, King Regis. Final Fantasy XV Pocket Edition was originally released on iOS, Android and Windows 10, and it’s hard not to see how the mobile-orientated design that underpins the game benefits the experience on Nintendo Switch. That largely comes from the fact that the story is broken down into 10 chapters, that, each lasting little more than an hour, make it manageable to play the action RPG in bitesize chunks on your commute. With no chance to backtrack (unless you want to replay a previously completed chapter), it’s best seen as a streamlined alternative for those that want to witness the story unfold in a shorter span of time. After you have pushed the Regalia into Hammerhead for repairs, you will hunt down the Bloodhorn, start searching for the magical Royal Arms to strengthen the power that Noctis wields and journey towards Altissia, where the crown prince is to wed Lunafreya. There are trials of the Gods to overcome, dungeons to hack your way through and even the chance to ride a Chocobo, leading to an adventure that, in entirety, is packed with more than enough spectacle to spur you through to its conclusion. And, when you aren’t carefully sneaking around Zu to grab a gem stone, there’s optional content that can pad out your play time. That can come in the handful of side quests that you can help with, discovering ingredients to allow Ignis to come up with new recipes, collecting Cactuar toys that have been hidden in different locations or deciphering clues to complete treasure hunts. Often little more than an entertaining distraction, it is the rewards that their completion earns you that make them worthwhile – whether that be temporary buffs from meals, bonus experience, useful items or stronger weapons. Strengthening your party is much easier than you would expect. Experience will steadily level up your characters, while stores offer mightier weapons and sturdier gear that can raise your attack, defence and other stats. You will also earn Ascension Points (AP) that are used on a spherical grid to unlock combat techniques. Whether strengthening Noctis or his friends, this can see you unlock new attacks, boost the damage that’s dealt when parrying or the chance to equip more accessories. Between the fully-voiced cutscenes, the moments where you can explore cities and driving the Regalia across the world of Eos, you will spend the rest of your time in battle. And, while the combat system has been scaled back compared to the original game, it certainly doesn’t lack depth. Noctis will, eventually, wield multiple weapons that you can freely switch between and, later on, you will be able to summon the Armiger to unleash the combined power of the Royal Arms that you have retrieved. Other combat mechanics have been carried across, like consuming MP to Warp-Strike to a distant target (Left Stick and X Button), performing a Dodge or Parry (B Button) in time whenever the prompt appears to evade an enemy swipe, or using destructive magic to damage multiple enemies. There are Ally Techniques that your brothers in arms will automatically use in battle, while Ally Commands, attacks that play to their individual abilities, are left to you, as Noctis, to command into action. And, if you manage to attack an enemy at the right time to make them vulnerable (usually just before they swing to make an attack), you can then inflict Break. This will let you deal heightened damage for a short time, making short work of weaker enemies while letting you pummel bosses into submission. There are stealth sections where you are required to warp Noctis to high vantage points to Warp-Kill patrolling Magitek Troopers, chaining his assassinations to take out multiple targets. Even the original game’s notoriously bad Chapter 13 works much better, with the player evading Metal Gear Solid-style cones of vision. And, for those that still lament the absence of an achievement system on Nintendo Switch, Square Enix has implemented an in-game list for you to unlock in the same way as on Xbox One and PlayStation 4. Where Final Fantasy XV Pocket Edition HD falters is in the presentation. The chibi character designs are an understandable change, but the locations in which you wander are bland and unmemorable. On the portable home console, the frame rate buckles in combat situations, which, as a frequent part of the action RPG, is a persistent annoyance that constantly detracts from the experience. It’s not unplayable by any means but it feels unoptimised, and, even a month on, it hasn’t been improved with a software update.